Witchwood is starting to settle down, which means we are getting a chance to see the players that are bound to stick at the top of the ladder for the coming months. Even so, there are still a ton of cool and interesting things climbing up to legend. We'll be covering many of those as time goes on, and this we're going to collectively dive back down into The Caverns Below . For those of you that don't remember, I loved the pre-nerf Quest Rogue and took it to legend after making some key alterations to the deck. As a result, when I saw the new lists popping up I couldn't wait to crack at them. While this build does what it has always done, five minions are a lot to play harder than four. No matter, this build found some great ways to hit that mark. Let's go see what they are. Shadowstep Shadowstep is, without a doubt, the most important card in the entire deck. Not only does it help you instantly trigger your quest, but, outside of extremely niche scenarios, you never want to play this on anything other than the card you're triggering your quest with. Burning a step on a non-bounce minion is almost never a good idea. The same minion five times is doable, but that doesn't mean it's easy. You have to work to use your bounces, and you can never waste a spell. Always read your opening hand, count up your potential minions, and then make a decision on which one you want to go in with. That is a move you have to stick with, so be careful. 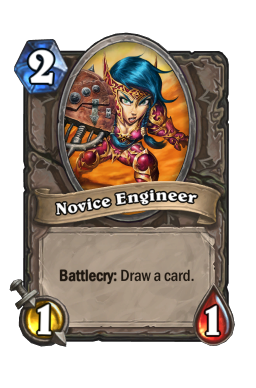 Going in on a Novice Engineer to get value may seem good, but when you have double Wax Elemental in hand it is typically the wrong move. 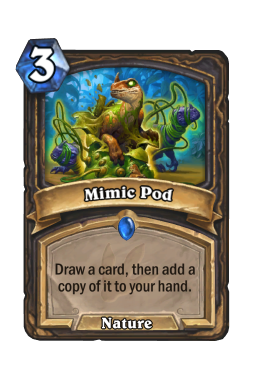 In addition, if you have cards like Mimic Pod you can hold back Shadowstep until you see what you draw from the spell. 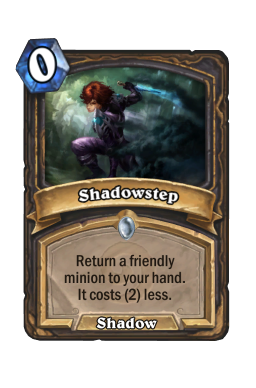 Shadowstep 's value is going to shift depending on what minions you have available to you. Novice Engineer is the best option across all games, but Glacial Shard is fantastic when playing against aggro or midrange. From there, everything else is basically the same. Just note that you never want to force a path. It may feel bad to go in on a minion that does nothing, but all you care about is completing your quest. If your only minion is Vicious Scalehide or Wax Elemental , then that is what you're going with. Also remember that, once you commit, you cannot leave your minion on the board unless you have another one in your hand. Shadowstepping a card back simply to save it for later is perfectly fine. Glacial Shard I said it last time we took a trip to The Caverns Below , and I'll say it again here: this list would not work without Glacial Shard . I first added the card to the pre-nerfed version back in the day, and the one drop rapidly gained popularity right before the quest got nerfed into oblivion (or so they thought). One of the more interesting things about this build is that you don't have to race to your win condition. Yes, you want to get your quest going as soon as you can, but that doesn't mean you need to force it. Your win condition is better than every other deck's, meaning that you can take a few turns setting it up with no consequence. Using Shard to slow things down while you draw or cycle into strong minions is completely fine. This card not only prevents damage, but it can stretch out the game to give you a few extra draws. Glacial Shard is all about buying time. Though there are going to be games where you lock down a Mountain Giant or stop a Hench Clan Thug from getting in, you just want to keep off pressure. Stopping a 2/2 or 3/3 may not feel incredibly exciting, but your only worry is to fend off early damage so you can complete the quest. It does not matter what kind of aggression your opponent puts out. If you can stop it, you should. 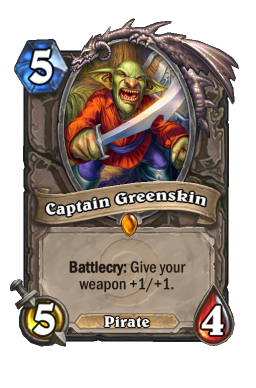 Also remember that, as noted in the videos, this card can be used on your opponent's face. It is easy to forget that at times, which can then leave you open to damage from Rogue, Hunter, and Paladin. 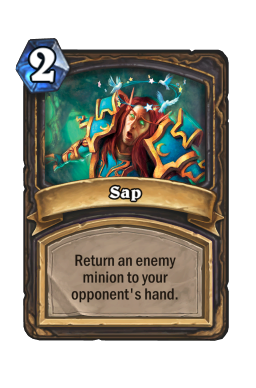 Even if your opponent has a weak board, using the 2/1 preemptively to stop a top-decked weapon is a great way to stop damage. 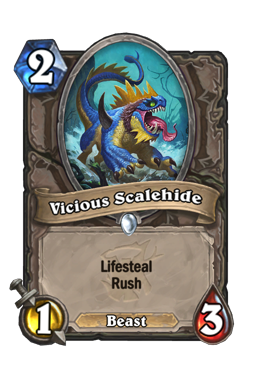 Vicious Scalehide The best new card in this build, Vicious Scalehide solves one of Quest Rogue's biggest problems. As anyone who has played with or against this decks knows, it is extremelyyyyyy susceptible to aggressive decks. 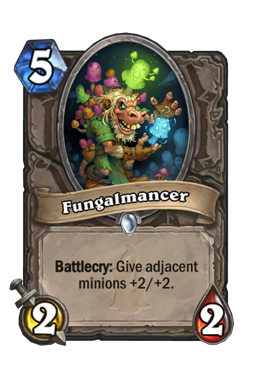 You want to play minions multiple times, which then opens you up to fast starts or builds that can absolutely pour on damage. Though there has been no way to fight that in the past, Scalehide helps combat aggro decks on two different levels. One, it gives you an early body that can chip down 1/1's or 2/2's. This is one of the best ways to combat Paladin and the 1/3 can keep them off your heels until you get things going. In addition, this card provides healing. Healing is something Quest Rogue has never had before, and being able to get back out of burn range once you complete the quest is going to win you a lot of games you would normally lose. As you saw in the video, when fighting aggressive decks you can be greedy with this card. Vicious Scalehide is typically going to be used early as a way to tie up the board, but if you have other ways to use your mana you can hold it back depending on the amount of pressure you're seeing. A 5/5 lifesteal minion is insane in the current meta and gives you a security blanket other threats don't. There are many games where your opponent will pressure you in a way where, if you complete the quest, you die to burn. However, if you can complete the quest and then clear the board/gain life in the same play it will completely ruin the best laid plans. It is pretty much over from there. Never assume you need to play the 1/3 early just because you can. It as a 5/5 is a fantastic option to have. Sonya Shadowdancer Another fantastic new addition to Quest Rogue, Sonya Shadowdancer is everything this build could want and more. 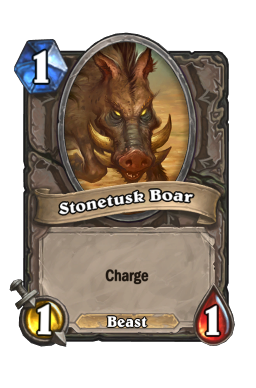 The 2/2's ability doesn't seem to explosive, but when combined with Stonetusk Boar , Southsea Deckhand or Vicious Scalehide she is one of the quickest and most efficient ways to complete the quest. You go in, kill your minion, get a 1/1 back, play it again, get a 1/1...Rinse and repeat. Always look for that combo potential and try to set it up as best you can. 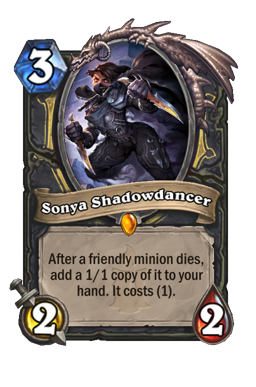 If you ever have a minion live you can also use Sonya to get it back into your hand and then go all-in with the quest that way. However, also note that Sonya has utility outside of a pure combo card. It is easy to see the 2/2 in one way, but she has a few useful modes. Being able to trade with what's on the board can give you a ton of utility that you normally wouldn't have access to, and using her with Valeera the Hollow also helps you get two copies of a minion into your hand. That is a great way to take advantage of the quest and use charge minions as AOE when needed. Never just assume she is for the quest. If you have other bounce spells in your hand do not be afraid to use her for value. She is also a great way to trade in a minion that you want when you have the quest online next turn. 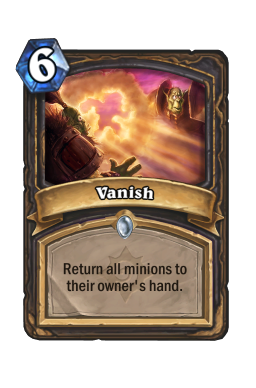 Vanish Another incredibly important card, Vanish has a ton of versatility in terms of setting up lethal and playing towards your win condition. Six mana is a lot to ask for this effect. However, as mentioned, you are not in a hurry. Many of your games are going to be on the slower side, and being able to take out everything in your way while also trying up your opponent's mana is just what this deck needs. While you want to save this for large Voidlord s when fighting Warlock, the use changes against every other class. 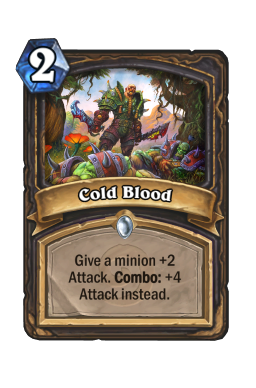 Sometimes this card comboes with Shadowstep to help you complete the quest, sometimes it is a way to simply slow down your opponent's aggressive push, and some of the time (a lot of the time) it takes out all taunts in your way to allow your minions hit hard. Just always try have a set purpose with the spell. It is extremely powerful and you never want to use it lightly. There are many tricky parts to using Vanish , and the most difficult is figuring out if you want to combine it with Preparation . The zero mana spell is extremely powerful because it makes The Caverns Below two mana. That is insane, and something you always want to push to when you can. However, being able to get rid of the entire board (and potentially bring some minions back to the hand) for three mana is always insanely powerful. The way you make that choice is based on when you need to get to your quest, how much pressure you're under, and how badly you need a two mana caverns. If you need to complete the quest and get it going immediately, then hold onto prep. However, if you're short on bounce spells or just need to both play minions and push back against your opponent, you want to take the discount on Vanish. Every situation is different, but it is important that using Preparation always comes at a cost. The four decks I see the most while playing the ladder. Control Warlock Number one again, Control Warlock has reclaimed the Hearthstone throne. That is bad news for many decks out there, but oh boy is it great for us. 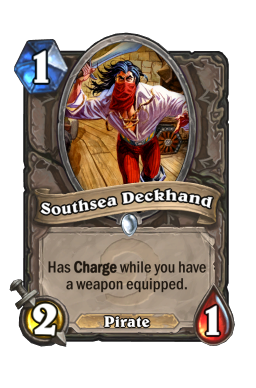 As mentioned, Quest Rogue suffers against fast decks but their strength is in beating slow ones. Warlock packs a punch, but they do so a few inches at a time. This game is going to have a simple trajectory. 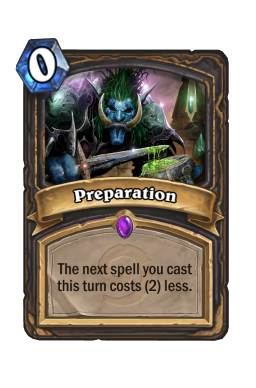 You begin by playing out what minions you have, going in on the quest around turn five or six, and then using your burst to finish your opponent off before they ever get started. Just do everything in your power to save both Sap and Vanish . Should the game go into the later turns you are going to need those spells to set up lethal. Getting taunt locked is one of the only ways to lose and you never want to let that happen. Once you hit the caverns you cannot lose as long as you have a clear left. Save and protect your Glacial Shard s. The 2/1 may not seem like much, but it shuts down one of the only ways you lose here. Warlock is slow, but they do have a few opening minions that can put on pressure in a hurry. 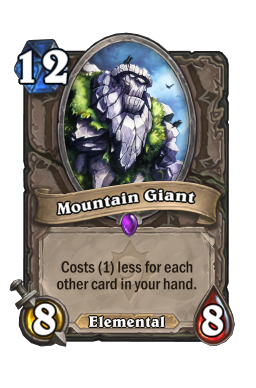 Cards like Mountain Giant and Doomguard are scary, and you want to freeze them rather than use your spells (which need to be saved for taunts) on them whenever possible. In fact, I would argue that doing the quest with shard is the best route to take against Gul'dan. As you can see in the video, I just let the one drop die, and I think that was a mistake. Having that extra life would have been invaluable and may have bought me the time to go over the top. The goal of this match is to wrap things up around turns six through eight. If you need to go longer you can, but you often don't need to. Spiteful Druid As Priest continues to adopt their Dragon Control decks, Druid stands alone atop Spiteful Mountain. This is an interesting match where you need to be in a hurry. It is ok to take some matches slow, but in this case you have to treat everything as if you're on a clock. That is because things are going to end soon after your opponent starts hitting their gigantic minions on turn five and six. Ignore your opponent's early threats as best you can and start re-playing minions as soon as possible. There are going to be times where you can take a turn off, but the general rule is to do everything in your power to make sure this game doesn't go long. Druid can flood the board and they will apply a ton of pressure as they move up the curve. While you cannot lose once you start spamming 5/5's, it is never going to be an easy climb to get there. Always favor your key minion unless you specifically need to stop lethal. As with Warlock, Glacial Shard is going to do a lot of work for you in this one. 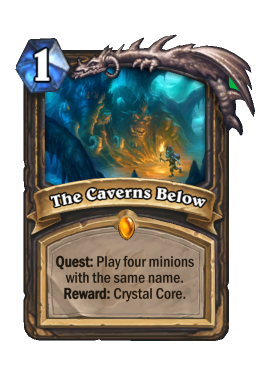 The 2/1 is always good, but using it on turn six to shut down whatever Spiteful Summoner pulls is a great way to get to the caverns. 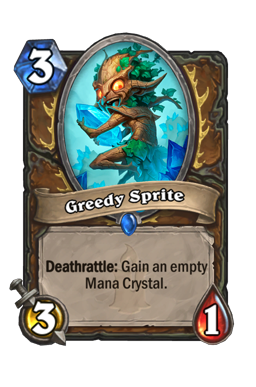 In addition, also note that freezing Greedy Sprite is a solid way to cripple your opponent's early ramp. A well-timed Vanish will also ruin Druid. 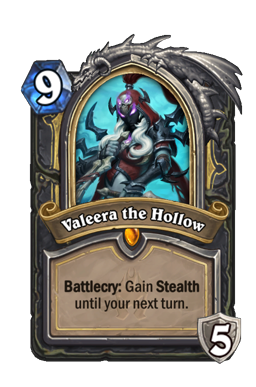 Hitting Spiteful Summoner on six feels incredible, but using it after a Valeera the Hollow is another great way to take the board. The clear is the only way you can stretch this matchup out. If you have access to the six drop spell, you can take a bit more damage early. Just never open yourself up to lethal. 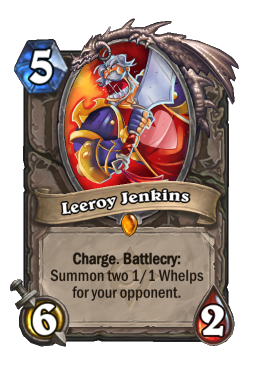 Fungalmancer is stock in Druid these days, and Leeroy Jenkins is extremely common as well. 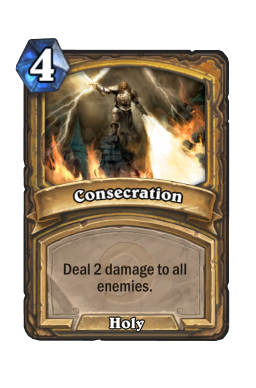 Odd/Even Paladin Though both Paladin types see quite a bit of play right now, I expect Even to take over as the resident Uther class in the coming weeks. Even so, if you want to play ladder you need to be ready to take on the light. The goal of these games is to get to the quest in a way that does not open you up to too much damage. When facing Odd you want to run out all early minions and trade as much as possible. That should then limit the power of things like Level Up! and give you a bit of extra time to build your engine. 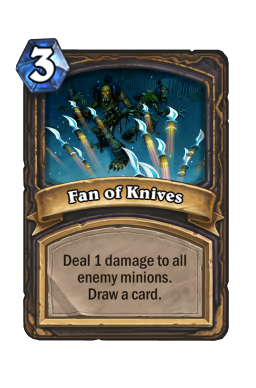 Fan of Knives is also an all-star in this one. Just remember to always use the spell before turn five. You don't want to be greedy or hold back for value. Rather, everything here just needs to be about keeping Paladin off the board and away from your face. In contrast, you have a much better time against Even. Odd Paladin is hyper-aggressive, while Even typically takes a little longer to get going. Turn four is where you want to have control of the board because, as always, Call to Arms is a nightmare. The four mana spell is still as strong as ever, and it will absolutely kill you if you aren't ready for it. Either have your quest nearly online by the time it comes down or be ready to fend it off with a Vanish or Sap . 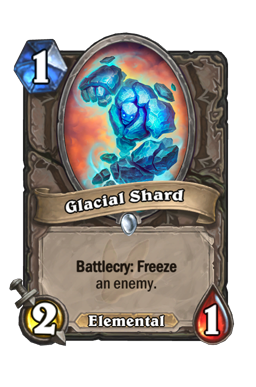 Glacial Shard is also strong here, but it doesn't quite have the same punch against annoying Knife Juggler s. Something else to realize is that Even Paladin has a lot of ways to stay alive as they move up their curve. For that reason, you want to kill them in one blow. Hold back a bounce spell for when the quest is done and hoard as many charge minions as you can. 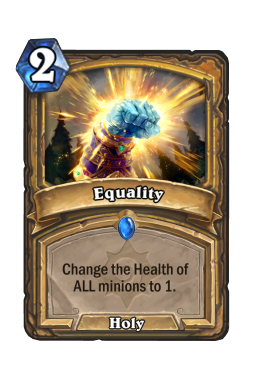 That will allow you to take them out in a way that dodges plays like Equality /Consecration . Baku Rogue Everything on paper tells me this matchup is going to be most difficult in the current meta. Not only does your opponent have access to their 2 damage-a-turn hero power, but they also have a ton of ways to put on extra damage. That then leads up to finishing burst like Cold Blood , Fungalmancer and Leeroy Jenkins . Even so, in my testing (and in the video) this game has largely fallen in Quest Rogue's favor. You win this game by eating a ton of early hits, and then going in on your quest through minions like Glacial Shard or Novice Engineer . All of your plays need to be to limit how much damage your opponent can do to you. Baku Rogue is a deck that can go from zero to sixty out of nowhere. When choosing your plays, understand your opponent's burst potential compared to how may turns you need to get to the caverns. 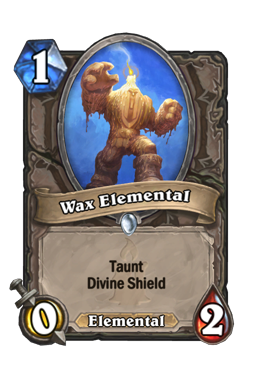 Wax Elemental is a great way to stop any annoying early Cold Bloods, while a Preparation /Vanish play can help reset the board if your opponent comes out of the gates too strong. If you're taking a lot of damage try your best to save Vicious Scalehide for the quest. Mulliganing with this deck follows one simple rule: look for bounce spells. You need to be able to get things going early, and you're never going to be able to do that unless you have ways to bring your cards back to your hand. 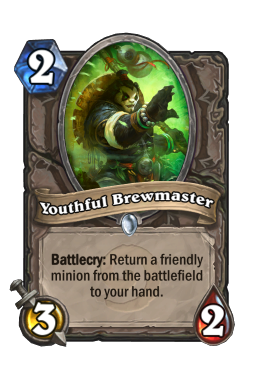 Shadowstep , The Caverns Below and Youthful Brewmaster should always be kept. From there, you simply want to keep one or two early minions that you can replay multiple times. Wax Elemental and Vicious Scalehide are both fantastic against aggro. Glacial Shard and Novice Engineer are must-keeps you want in ever matchup. Mimic Pod is strong against slow decks or with a good opening, Sap should be kept with a good hand against Warlock, and Fan of Knives is for Paladin. 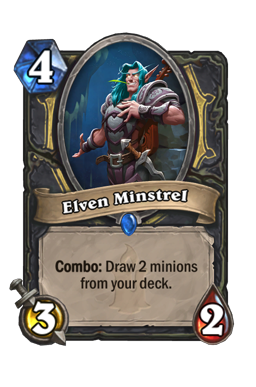 Finally, you should always keep Elven Minstrel if you have a good opening and the coin. Man, it's been a long, long while. Five minions is definitely more than four, but Quest Rogue has not gotten any less fun. There are so many decisions with this deck and you can feel the moves that directly lead to wins or losses. That is always fun because, not only does it give you a great sense of agency (which we know is not always in this game) but it also helps you get better. Recognize your potential routes, try different things, and then record what works and what doesn't. Until next time, may you always find what you're questing for.